Starting on June 27, the Bermuda Rowing Club will launch their annual Learn to Row [LTR] courses for adults and juniors under internationally qualified coach Nigel Gallaher of “Community Rowing” in Boston. The adult sessions will be held from June 27 to July 22 and the junior sessions will be held from July 4 to August 2. Adults meet from 6.00-8:15 either Monday/Wednesday/Friday or Tuesday/Thursday/Saturday for four weeks at $395, while the junior programme will meet from Monday to Friday from 9.00am to 12.00pm in one of two 2-week sessions at $300 per session. A spokesperson said, “Rowing Club members have been celebrating the success Bermuda’s Olympic rowing qualifier and Club member Michelle “Shelley” Pearson. 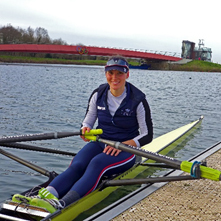 Starting today, June 16, through June 19, Shelley will compete in the Women’s Single Sculls competition at the World Cup III in Pozan, Poland. “Shelley is the 3x National Champion at Peddie, Jr Worlds Gold medalist in USA JW8+, Radcliffe [Harvard] Stroke, First Ivy League Champions, and Winner of the Woman’s Boat Race as an Oxford Blue. Shelley was most recently awarded a Gold medal at the Latin American Olympic Qualifier, Woman’s Single Scull and now is an Olympian for Bermuda. To register for the Learn to Row programme, email bermudarowingassociation @gmail.com.